Use care to not damage or tear vapor barrier during removal. Partially remove the rear door window run rubber. 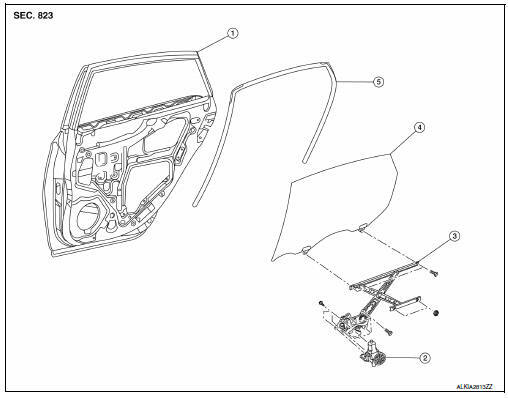 Remove bolts (A) and the rear door glass rear run channel (1). Temporarily reconnect the rear power window switch to raise/ lower the rear door glass until the rear door regulator to glass bolts (A) can be seen through the access holes. 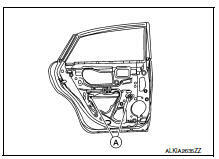 Remove the rear door regulator to glass bolts (A). Raise up the rear door glass and hold with a suction lifter (A). 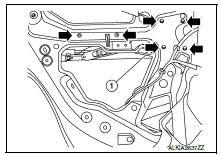 Disconnect the harness connector from the rear door glass regulator. the rear door glass regulator (1). 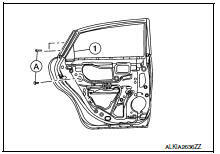 Check the rear door glass regulator for the following items. If a malfunction is detected, replace or grease it. Apply multi-purpose grease at sliding points.